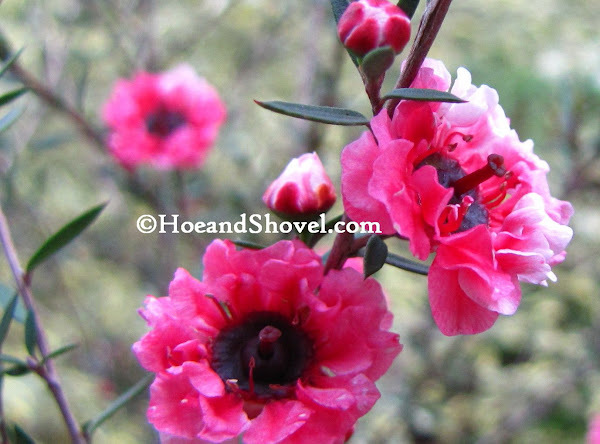 As we continue to feature the sturdy and foundational plants of winter's garden let's have a look at Leptospermum scoparium New Zealand Tea Tree (or Rose). She's beginning to add some splashes of rosy hues among the evergreens. In order to qualify for the cold hardy files around Hoe and Shovel a specimen must also have the vital classification of being 'drought resistant'. Possessing those two qualities all at once is a huge accomplishment. A plant that does well both in our absurdly humid summers as well as maintaining form, function, and vigor in our frosty and/or below freezing winters deserves some accolades. I first introduced these shrubs (here) as I built the northside berm last Jan/Feb. We were in the middle of a brutal winter when I began digging out that area that was newly planted as the seasons began to transition. At the time I felt it was a bit of a risk to plant them. I'd never seen New Zealand tree rose before and I didn't know anyone who had any experience with them. But it's always fun to give something new a chance to show us what its got. Three of them are positioned next to the (also cold hardy) (1) Chamaerops humilis european fan palm and in front of (also cold hardy) (7) Ligustrum sinensis 'Variegata'. NZ tea rose happily fill in a layer behind the Dianella tasmanica 'Variegata' Flax Lily that serves as a border to the berm. Once established, the ultimate test was to see if they endured through our summer and give us another season of blooms. They've only just begun to pop out with with buds and a few blooms in the last few weeks. Right in the midst of our freezing temperatures. Unshaken. One year later New Zealand tree rose continues to perform as wished. I wouldn't describe her as overly showy but rather more subdued in her humble, quiet beauty. Likely she will appear in another blog post or two now that she has proven her stability and worth. I'm looking forward to seeing her when she completely flushes out in bloom but for starters she is adding some much needed color to the GREEN of winter. Ooohhhhh, I love that. I had it many years ago, but it croaked on me. Your blooms are absolutely beautiful. 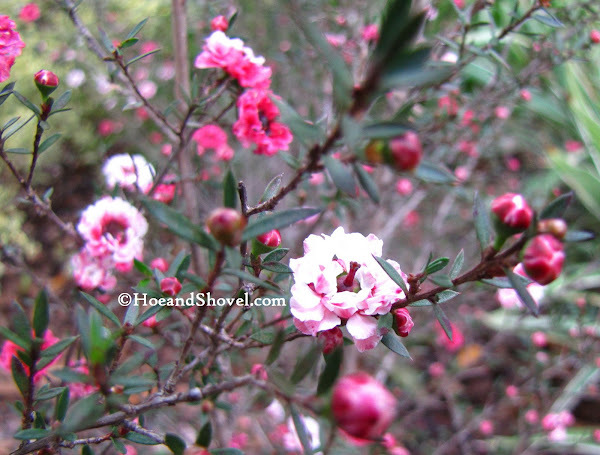 How lovely to have such bright blossoms in winter. Lovely. Blooming just when we are desperate for some color. Hi Meems...Your New Zealand tea flowers are very pretty...lovely color. 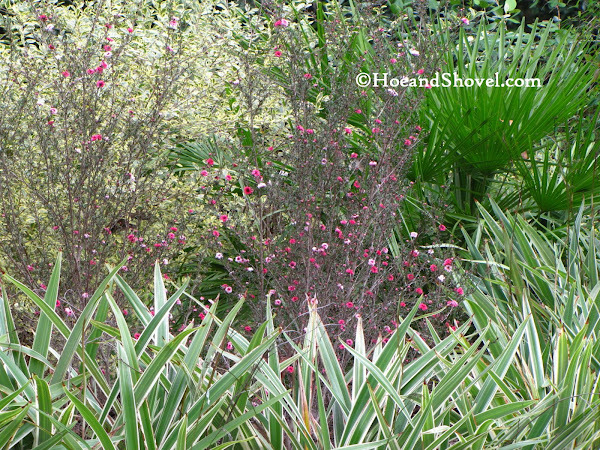 I remember this plant when I visited...it is very nice even when it's not blooming. 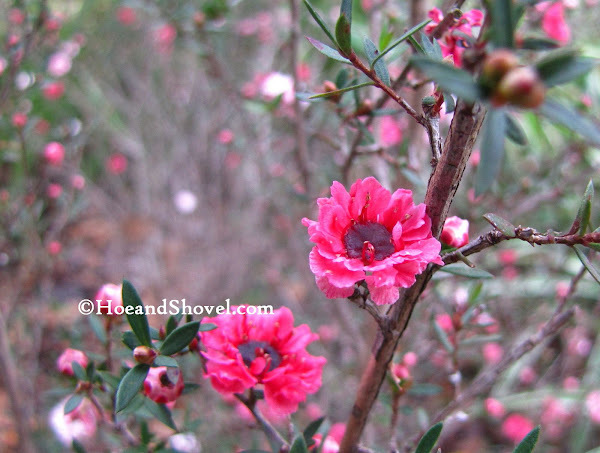 It seems as though any plant that blooms at this time of year gets a lot of attention and is most welcome. I use that cut in floral work so often when it is in season. Too cold to try that one here in Charleston. Enjoyed the post. Love to see the color this time of year in your in your vibrant photography!!!! Thanks for sharing! I've seen them for sale but always wanted to know for sure that they'd do well in our summers. Now I know! By the way, if you're trying to combat spammers without using the crazy words, you can set it up where blogger has you approve posts that are over a week old. Most spammers try to do their shenanigans on the older posts for me anyways. You have to love winter bloomers. I'm not sure there is a secret. I never did let them get super dry but this year I won't worry about that too much... we'll see how they do in their second year. Their blooms should only get more profuse as the weeks go on... at least that's what they did last year. Well, I'm not usually thinking 'magical' except when I plop myself down somewhere and listen to all the buzzing critters and feel the sunshine on a cool day. That's close to magical. Thanks, friend. This plant does offer a unique form and texture even when not in bloom. For that matter the foliage color sets it apart also. Nice to see blooms in winter. What a great idea! I'd not thought of it but I will use it that way now too. Thanks. Wouldn't it be interesting if it was the same the plant! It is amazing how tiny each bud and flower is on this plant. The flowers start out lightly hued and get darker with age. Fascinating. I giggled at your "cold hardy" plant. I know it isn't funny to you but when we are nearly encased in ice it seems a little funny to read. I really envy you your warm growing conditions on days like today. I love to come to your blog for a shot of color and form to asuage my color starved soul. 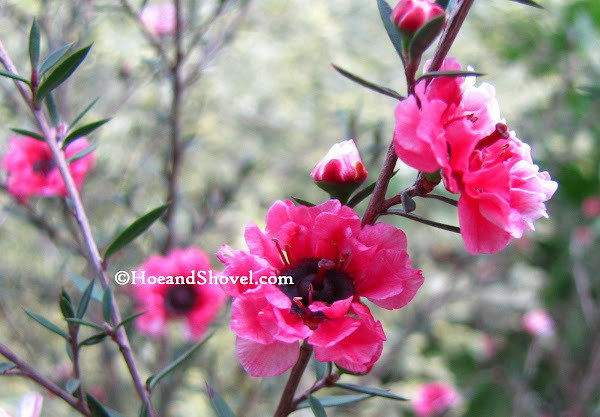 This is such a gorgeous little shrub. We can grow it here in the north as a patio plant and bring it indoors over the winter, but I'm having a terrible time finding it this year. Do you know of any nurseries that will ship it? Thanks so much.